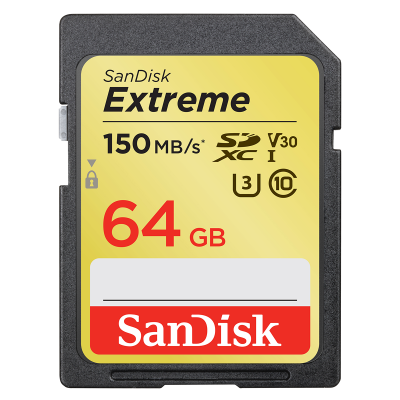 The SanDisk Extreme® SD™ UHS-I memory card delivers performance that lets you take control of your creativity. With shot speeds up to 70MB/s* [128GB-256GB], and UHS speed Class 3 (U3)*2 recording, you’re ready to capture stunning high-resolution, stutter-free 4K UHD video*1. Its accelerated transfer speeds mean you can quickly move your photos where you want them. Plus, it’s built to withstand weather, water, shocks and other less-than-ideal conditions so you can rest assured that it’s good to go wherever you go. Rated UHS Speed Class 3 (U3) and Video Speed Class 30 (V30)*2, the SanDisk Extreme® SD™ UHS-I card lets you capture sequential burst mode shots without missing a beat. Built for and tested in harsh conditions*3, the SanDisk Extreme® SD™ UHS-I card is temperature-proof, waterproof, shock-proof, and x-ray-proof. Includes an offer for RescuePRO® Deluxe data recovery software which lets you restore images you accidentally deleted*5. The SanDisk Extreme SDHC and SDXC UHS-I Cards are backed by a lifetime limited warranty*4. * [128GB-256GB] Up to 150MB/s read speed. Engineered with proprietary technology to reach speeds beyond UHS-I 104MB/s, require compatible devices capable of reaching such speeds. Write speed up to 70MB/s. Based on internal testing; performance may be lower depending on host device, interface, usage conditions and other factors. 1MB=1,000,000 bytes. * [64GB] Up to 150MB/s read speed. Engineered with proprietary technology to reach speeds beyond UHS-I 104MB/s, require compatible devices capable of reaching such speeds. Write speed up to 60MB/s. Based on internal testing; performance may be lower depending on host device, interface, usage conditions and other factors. 1MB=1,000,000 bytes. * [16GB-32GB] Up to 90MB/s read speed. Write speed up to 40MB/s. Based on internal testing; performance may be lower depending upon host device. 1MB=1,000,000 bytes. 1. Full HD (1920x1080) and 4K UHD (3840x2160) video support may vary based upon host device, file attributes and other factors. See: www.sandisk.com/HD. 2. UHS Speed Class 3 designates a performance option designed to support 4K UHD video recording with enabled UHS host devices. UHS Video Speed Class 30 (V30), sustained video capture rate of 30MB/s, designates a performance option designed to support real-time video recording with UHS enabled host devices. See www.sdcard.org/consumers/speed. 3. Card only. See product packaging or www.sandisk.com/proof for additional information and limitations. 4. 30-year warranty in Germany, Canada and regions not recognizing lifetime warranty. See www.sandisk.com/wug. 5. Registration required. Terms and conditions apply.